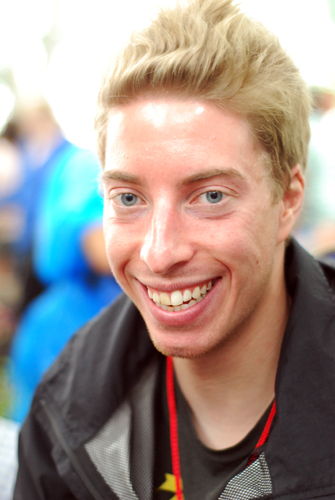 When James and I moved back to the U.S., we moved to just west of New York City. We knew not a soul. We had no traditions, no friends, and no clue what to do in our new home for entertainment. We were pretty poor after an international move, so we tried to find a lot of free or cheap things to do on the weekends. Things that meant we weren’t hanging around the townhouse staring at the television or computers. It’s no secret that I’m a Texan, and I like to blog about Texan things. 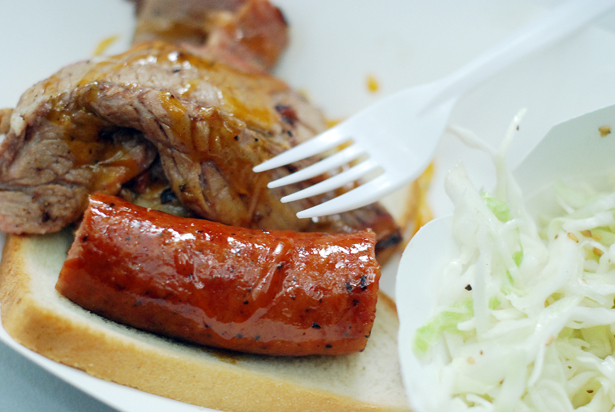 And you should probably know this if you don’t already: Texan = Barbecue Enthusiast. Us Texans, we just LOVE our meat. Seriously, James and I once took a British vegetarian friend home to meet my family. My mom might have uttered the words, “vegetarian.. that means she only eats chicken, right?”. Seriously, folks. 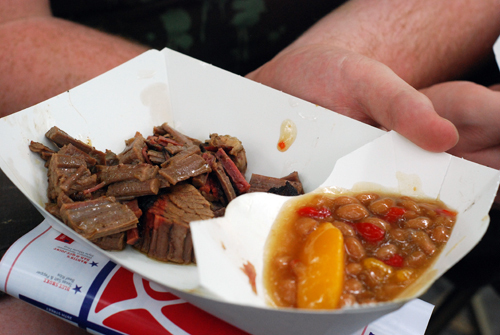 In Texas, most folks think vegetarianism is this foreign thing where you just don’t eat beef. And we’re pretty suspicious of that sorta behavior in Beef Country. Back then, we occasionally got a Sunday newspaper for the coupons. I was looking through it on a sunny Sunday morning in June and happened to notice this full page spread about what to do that weekend in and around North Jersey. The giant letters, “BBQ” caught my Texan eyes and held them. I dressed quickly. I rushed James along. “Let’s go! Let’s GO!” I kept repeating until we were in the car and on our way to Madison Square Park. 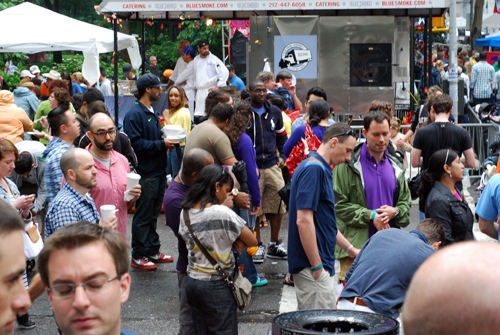 Every year since then, James and I have been attending the Big Apple Barbecue Block Party. It’s a Summertime tradition for us. 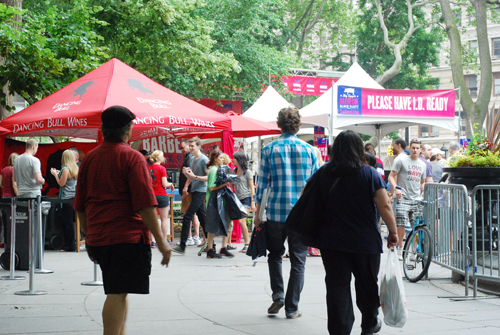 The Big Apple Barbecue, or BABB to those in the know, has been held since 2002, when it started in front of the Blue Smoke in New York City with just a handful of vendors. I hear that only a handful of people showed up too. 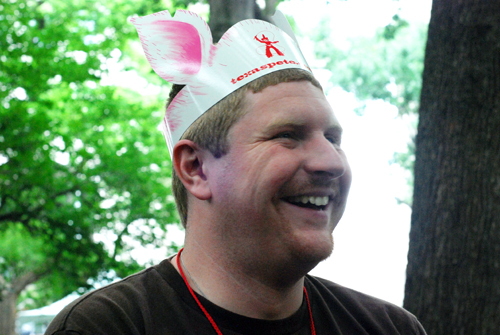 Now it’s host to more than fifteen barbecuers from around the United States, some of them world famous. 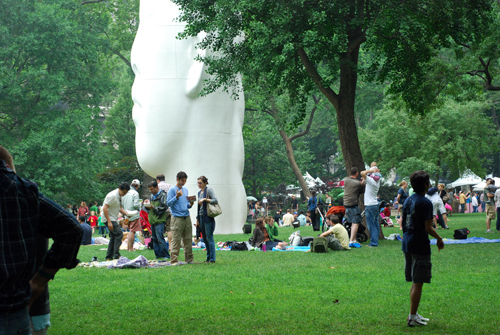 Over a hundred thousand people attend. My favorite barbecuer, not surprisingly, is Austin/Driftwood’s The Salt Lick Bar-B-Cue. I wish there were more Texas representation, but The Salt Lick does well. Twice in two years, The Salt Lick has brought me to tears. Last year, it was because they had to cancel at the last minute. Pit Master Michael Rodriguez fell and broke his leg just a few days before the BABB weekend. It seemed especially cruel that since it was so close to the event, all the printed materials carried their name, their offerings, and logos. I am so glad Pitmaster Rodriguez recovered well and was able to attend this year’s Barbecue, because when I had my first bite of perfectly smoke-ringed brisket, followed by the perfect snap and spice of Hill Country sausage, I indeed teared up. Sincerely, his food tasted like home. I’ve never been so happy and so homesick at the same time. The event is not only full of Barbecuers (and the delicious smell of meat and wood smoke) but plenty of other vendors too. Texas Pete’s, the Austin Convention and Visitor’s Bureau, Snapple, and Maker’s Mark Bourbon were just a few of the stalls I saw around the park. 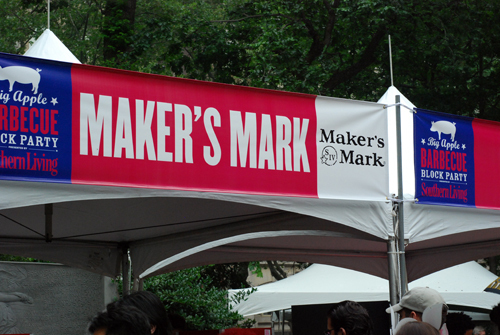 It was the Maker’s Mark stall that gave me pause. What’s this? Free caramel popcorn? Make that free bourbon caramel popcorn! How can I refuse boozy caramel corn? Simple answer: I can’t. And you shouldn’t. 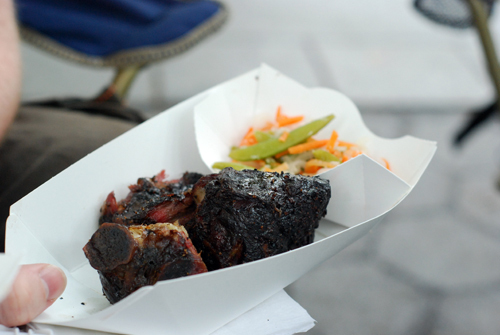 Jack’s Old South Brisket – the star here was the peach, red pepper, and bacon barbecue beans. Salt Lick Brisket and Hill Country Sausage. 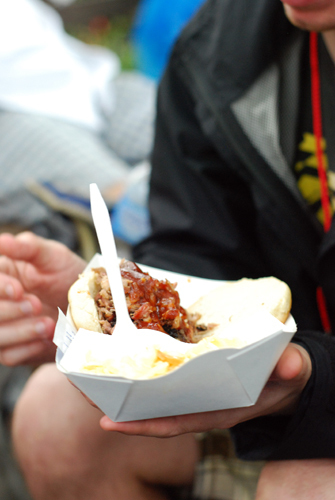 As James says, you know you’ve got Texas barbecue when it’s served on a piece of Wonder bread. Nom. One happy husband after three plates of barbecue! Our dear friend Andy, about to dig into plate number four of barbecue. Said plate number four. 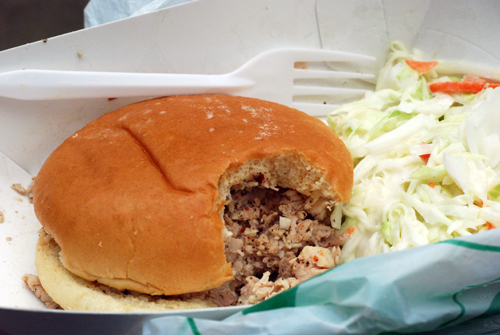 The Pulled Pork sandwich from Big Bob Gibson Bar-B-Q. It was *really* good. 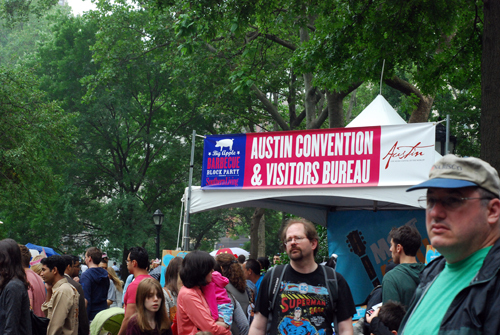 The Austin Convention and Visitor’s Bureau. I entered to win a trip for 2. Here’s hoping! This new piece of art sort of freaked me out. If you couldn’t guess, this is one popular event. The stall of popcorn happiness. Our last barbecue plate of the day, Ed Mitchell’s smoked turkey. Then I spotted this. HELLO DESSERT HEAVEN. This is when we thanked the sweet Lord for our FastPass. The line for fried pies was a good 45 minutes to an hour long if you didn’t have one. 20 minutes if you did. We got blackberry, apricot, and apple pies to share. A piece of Texan Handpie Heaven. We went to the BABB all day on Saturday. Having blasted through our FastPass for the event, we spent Sunday recovering from a meat hangover, and I went to work making more of that incredible, amazing, addicting Bourbon caramel popcorn. As much as I loved the Maker’s Mark, being a Southern girl at heart, I switched it up by using Southern Comfort instead. The notes of vanilla, cinnamon, and clove only improve the caramel. James took this to work on Monday (because Lord knows I could not have it in the house for one moment longer, lest I devour the entire bag) and said it disappeared in record time – a mere five minutes after he put it out. I’m posting the recipe today, for Father’s Day, because my dad loves popcorn. It’s his favorite snack, especially while he watches sports. Whether it’s golf, football, or basketball, Dad prefers to watch with a big bowl of popcorn. The recipe comes together so quickly, if you’ve got all the ingredients on hand, you can be enjoying Southern Comfort Caramel Corn in about half an hour, including cooling time. Talk about Man Food! I used an air popper to pop the specified 1/2 cup measurement included with the machine. According to the manufacturer’s website, this makes approximately 18 cups of popped popcorn. Place this is a very large bowl and set aside. You can also oil pop popcorn if you desire. Pop the popcorn and place in a very large bowl with room for stirring. If necessary, separate into two large bowls so that you have room for stirring without spilling over. Line a large jelly roll pan with foil. 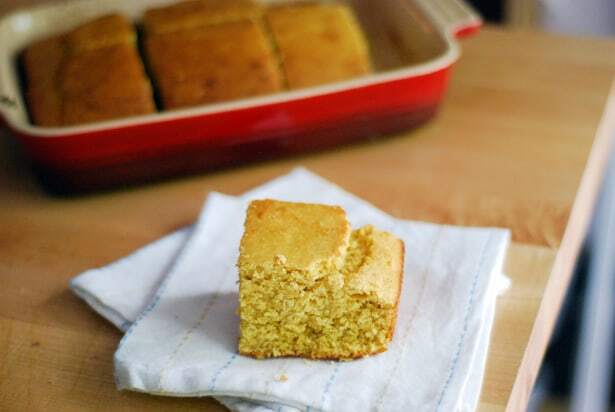 In a large saucepan, heat sugar, butter, vanilla extract, salt, and Southern Comfort on medium heat, stirring often. Continue to stir until sugar melts and a deep caramel color is achieved. Double check that you have everything ready, because the addition of baking soda to the caramel will cause it to double in size quickly and bubble up. When you are ready to coat the popcorn, add the baking soda to the caramel and stir quickly. Remove from heat and pour over popcorn (eyeball about half the mixture into each bowl if you’ve had to split into two). Stir the popcorn quickly and immediately after covering with the warm mixture so that ever piece gets some coverage of the caramel. Spread the caramel coated popcorn onto the foil lined jelly pan and allow to cool for approximately 10-20 minutes. Peanuts or cashews would also be an excellent addition to this caramel corn. Please be extremely careful when handling hot caramel. This stuff is super sticky and as the sugar and butter turn into caramel, they reach pretty much volcano heat. If you can, try to do the pouring with heat resistant kitchen gloves. I love caramel corn. And I bet either So Co or bourbon would make spectacularly amazing. Looking at your picture, I want some RIGHT NOW. I also now want to attend the BABB. Too bad I’m in California and it’s July. Maybe next year. YUM! This is a terrible place to hang out right before dinner! I am STARVING now, and there is no food in sight. And what’s worse, now I dont want what I was going to make, I want barbeque! You said two of my favorite things…Blue Smoke and Salt Lick. Next year can I please join you at BABB? Pretty please? Caramel and bourbon on a crunchy snacktime favorite? I am so there. Shaina, it’s certainly a grown up treat that you and Ole will LOVE. Wow, what a fun looking festival of food! Looks like you had a great time and took a lot of amazing photos between the yummy things you ate! 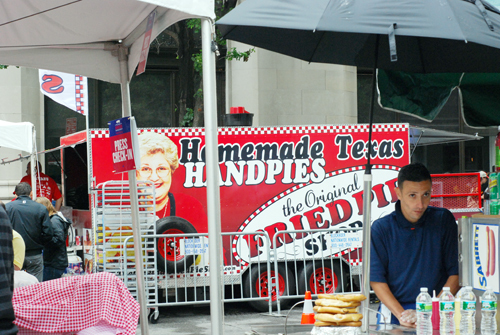 As a new Texan (my husband and I just moved to Austin from California), I can’t wait to get my fill of festivals like this and try more of Texas’s delicious food! Thanks for sharing. 🙂 You have a beautiful blog and I’ll definitely be back! Welcome to Texas, Georgia! (I feel I can say that even though I’m in New Jersey. Thank you for your lovely comment. Tracy, next year you’ll have to come down and go with us. It’s so much fun! Oh my dear – this is one festival I would not be able to pass up each year. What fun! And that caramel corn? Over the top – what a delicious looking recipe! It really is a blast, Kristen! I hope you try the caramel corn, it’s divine. Droool. This is now my favorite kind. It lasted in a ziploc for us through the weekend, and only started to go soft/stale when I accidentally left the ziploc open overnight on the 3rd day. James took his bag to work on the 4th day, and it was fine (and devoured instantly). So I think so long as you keep it air tight, you can store it for quite a while. This looks amazing! Does it store well? I know it would probably disappear super quickly, but could I make it a night ahead, or make extra? Ooo, caramel corn with a kick! I love the idea. P.S. Small typo in your recipe–it doesn’t say how much SoCo..I’m guessing 1/4 cup?